Barack Obama issued a presidential proclamation Wednesday, ordering that U.S. flags around the world fly at half-mast in honor of Sen. Edward Kennedy, who died late Tuesday night. The proclamation applies to flags at the White House, public buildings, and U.S. embassies, consulates and military installations around the world as well as those on U.S. Navy ships - but the orders are customarily observed by anyone who flies the flag. The flags are ordered to fly at half-mast until sunset on Aug. 30.
senators of our time, but one of the most accomplished Americans ever to serve our democracy," the president said in a statement accompanying his decree. "Over the past half century, nearly every major piece of legislation that has advanced the civil rights, health, and economic well-being of the American people bore his name and resulted from his efforts. 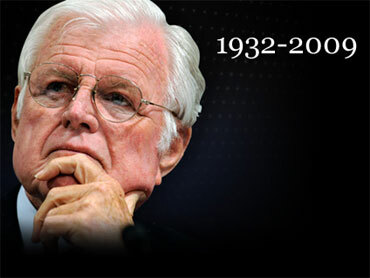 With his passing, an important chapter in our American story has come to an end." Kennedy was the last surviving brother in an political dynasty and one of the most influential senators in history. He died following a yearlong struggle with brain cancer. He was 77. Brothers "Would Have been Proud"
In nearly 50 years in the Senate, Kennedy, a liberal Democrat from Massachusetts, served alongside 10 presidents - his brother John Fitzgerald Kennedy among them - compiling an impressive list of legislative achievements on health care, civil rights, education, immigration and more. In a brief statement to reporters at his rented vacation home on Martha's Vineyard, Mass., Mr. Obama eulogized Kennedy as one of the "most accomplished Americans" in history - and a man whose work in Congress helped give millions new opportunities. "Including myself," added the nation's first black president. CBS News has learned that Kennedy will be buried at Arlington National Cemetery. At the eternal flame rests four Kennedy family members, including the former president, Jacqueline Kennedy, their baby son, Patrick, who died after two days, and a still-born child. Former Sen. Robert Kennedy F. Kennedy is buried a short distance away.